Laundering clothes doesn’t usually make the list of high impact educational experiences. Most high schools provide students with a variety of educational activities: field trips, extra circulars, and other hands on activities. 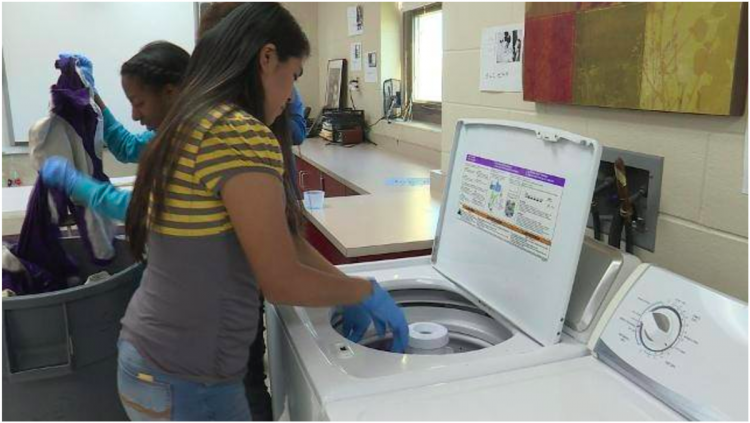 Cody Klintworth and Lori Lange, Special Education teachers at Beloit Memorial High School, have turned a few sets of washers and dryers into a transformational experience. They started the Loads to Success program to address two issues they’re passionate about: providing their special education students with hands on job experience while helping low-income students who have limited access to laundry facilities. When addressing the needs of low-income students, oftentimes initiatives focus on “essentials” such as food, clothing, or school supplies. However, some students do not have easy access to laundry facilities – and even if they do, laundry detergent can be costly for families on a tight budget. Klintworth has observed that this can create a situation where the student is ostracized, which can cause students to skip school to avoid embarrassment. Simultaneously, Klintworth was searching for opportunities for his Special Education students to get job experiences. He said it is important to give his students the opportunity to hone their teamwork, organization, and math skills – as well as being on time and reliable. “We’re all about getting the most job experiences that are universal,” he stated. At the onset of the program, the Loads to Success program was happy to receive donated washers and dryers; however, most of the machines are old. Klintworth knows he will have to repair – if not replace – some of the machines in the near future. Also, he stated the program has many hidden costs. Some of these include the laundry detergent and supplies needed for tracking laundry. Also, the Loads to Success rewards student participants for their hard work with outings, which also provide the students with practice spending money and other real world experiences. To support the ongoing costs of Loads to Success, Klintworth has turned to his district’s Classmunity platform to raise funds. Klintworth stated that Classmunity has made it easier to raise funds, and he appreciated being able to “…add our flair to the page” through Classmunity’s customization features. He also stated that the backend dashboards were helpful in managing the fundraising aspect of Loads to Success, particularly relating to tracking donors that are owed thank-you notes from the students. If you’re interested in supporting this wonderful program, please visit their fundraising page!